China Travel Log 4: On His Final Day in China, Secretary Bryson Highlights Travel to the U.S.
Secretary John Bryson spent his last day in China in the financial capital of Shanghai. He began his day with a group of American business leaders based in China. The leaders, members of American Chamber of Commerce in Shanghai and the U.S.-China Business Council, exchanged ideas and shared information about the opportunities and challenges of day to day business operations in China. As Secretary Bryson said to the group, our bilateral trade with China reached over $500 billion last year, with U.S. merchandise exports reaching $100 billion for the first time. However, with a trade deficit close to $300 billion, we still have a lot of work to do. The Secretary then gave remarks at a tourism event, highlighting the robust and growing travel of Chinese tourists to the United States. In his remarks, Secretary Bryson pointed out that "travel and tourism between our countries is crucial to building stronger cultural and economic ties. This generates greater understanding and friendship between our people. And yes, it also generates greater prosperity." With the Strategic and Economic Dialogue complete, Secretary Bryson traveled to Nanjing this weekend for meetings with Chinese provincial officials to discuss how the U.S. and China can continue to work together to strengthen the economic relationship between the two countries. Nanjing, in eastern China, is the capital of Jiangsu province. With a population of over 8 million, the city is an important cultural, educational and economic center, located a little over an hour from Shanghai. Secretary Bryson's weekend began with a meeting with Nanjing Municipal Party Secretary Yang Weize, where Secretary Yang spoke about the history and culture of the city that was one of the four ancient capitals of China. Secretary Yang also highlighted the city's commitment to innovation and education. Over 800,000 students study at colleges and universities in the city. Secretary Bryson expressed his thanks for the hospitality he has been shown in the city and his eagerness to learn more about the future of Nanjing, a city where imports from the United States are on the rise. 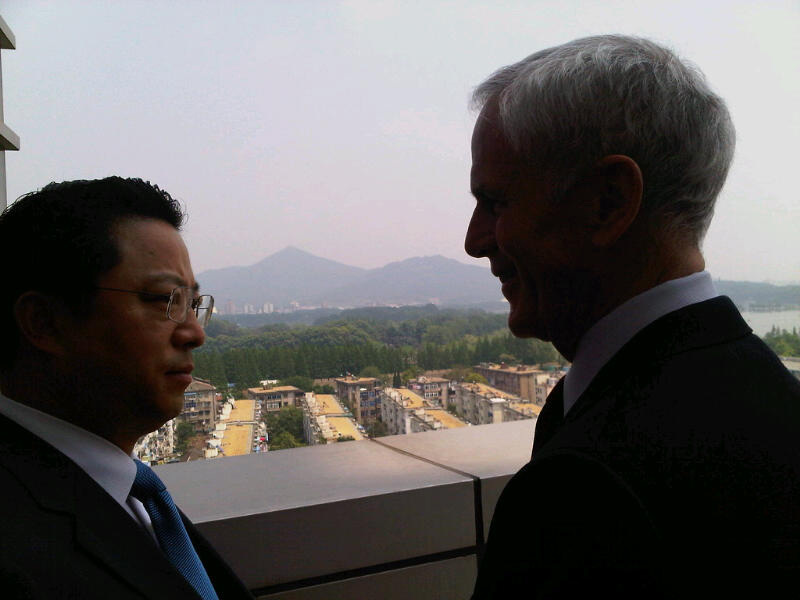 The two also spoke about how Nanjing is set to host the Youth Olympics in 2014, the second time the games will be held.